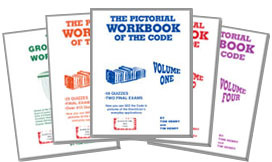 This book "Pictorial Workbook of the Code: Volume Two" was written and put into pictures for the student to make the Code easier to understand. Volume Two covers Articles 220 service and feeder calculations, Article 225 outside branch circuits and feeders, Article 230 service requirements, Article 240 overcurrent protection rules and taps, in pictures. Volume Two includes a total of 25 quizzes and four final exams with answers! A must book for every electrician to "learn" the Code. This workbook is also included in our: new 5 or 10 Volume Library of books! Volumes 1-4 and the Grounding Workbook.